The world of professional divers watches will never be the same again. In cooperation with professional offshore divers Oris has developed the innovative Rotation Safety System. In the world of professional diving, where mistakes can be fatal, the Oris ProDiver Chronograph is the ultimate in safety equipment. The rotating top ring has a specially designed grip made of durable, shock resistant, vulcanised rubber. The ring must be lifted before it can be turned: offering twice the protection of a standard divers’ safety bezel. 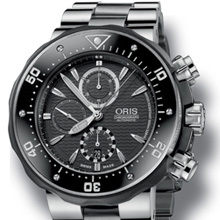 But the safety system of the Oris ProDiver doesn’t end here. The lightweight titanium case also houses a black DLC coated side safety barrier, which protects the crown and chronograph pushers, allowing them to be screwed to the case. This also ensures the water resistance of the ProDiver in depths of up to 1000m. An in-built, automatic, self-regulating helium valve is ideal for professional divers who do their job in deep-sea conditions and spend weeks at a time in a diving bell. The black and white zone counters of the chronograph displays offer the diver even more accurate dive timing. The white Superluminova of the hands and indices is ultra visible – even at massive depths where no daylight shines through. 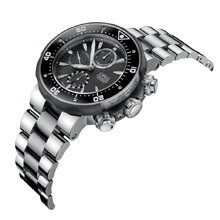 • Automatic mechanical movement with chronograph function. Centralised hour and minute displays, small second at 9 o’clock. Centralised second counter, decentralised minute and hour counters. Date at 6 o’clock. • Multi-piece titanium case. Screwed case back with special metres-feet scale engravings. Sapphire glass domed on both sides with inner antireflective coating. • Black two piece dial with printed wave pattern. Applied indices with Superluminova inlay. Nickel hands with Superluminova inlay. • Extendable rubber strap with folding safety clasp. Also available with extendable multi-piece titanium bracelet. • Set includes case, separate metal bracelet and tools.